Kartofelniki with Meat and Mushroom sauce for dinner tonight! 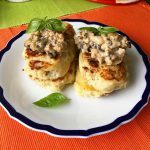 Kartofelniki is a Russian, Ukrainian, Belorussian dish, stuffed baked potato patty. 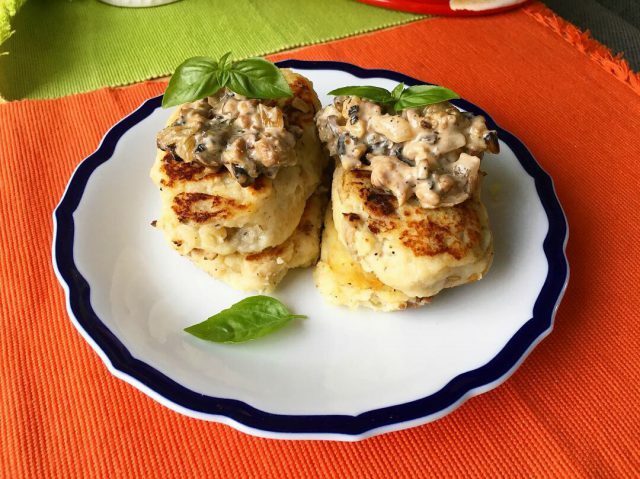 You can make them with different toppings such as meat, mushrooms, vegetables and serve with different herbs, sauces or cream, however it is normally served with sour cream. Tasty fried ‘kartofelniki’ can be a side dish to meat, but they are good with different fillings and used as a main dish as well. 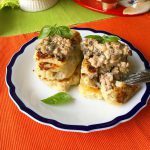 In this recipe the stuffing of meat can be replaced by mushrooms.